Asakusa is a neighbourhood in the northeast of Tokyo city adjacent to the Sumida River. 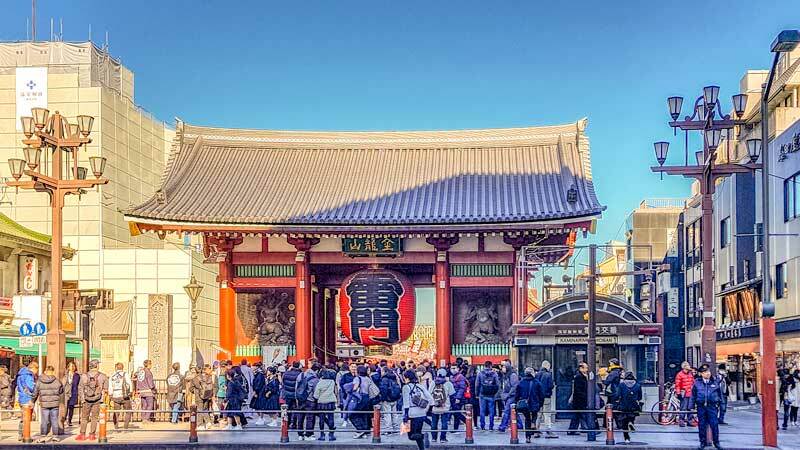 It’s known to visitors for the historic Senso-ji temple and spectacular views from the Tokyo Skytree but let’s take a deeper look at things to do in Asakusa. 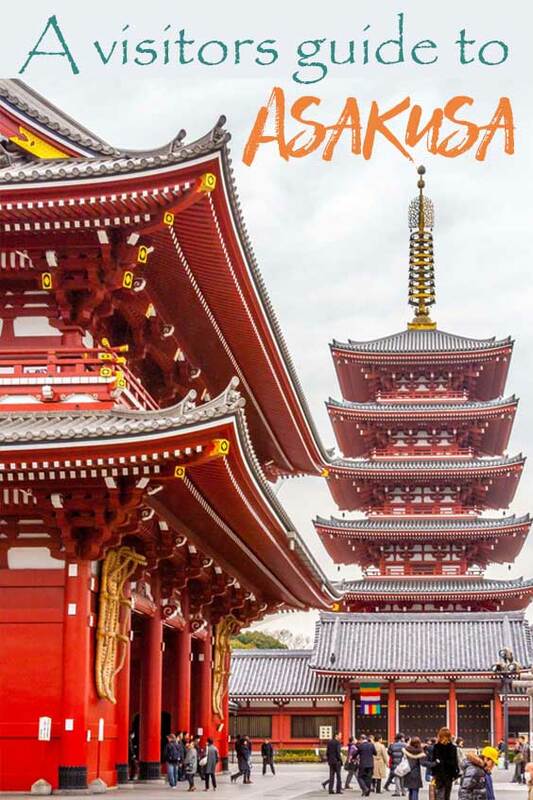 We’ve been travelling regularly to Japan for quite a few years now and thought it might be useful to take a look at some of the different parts of Tokyo, what the attractions are in each, the foodie highlights and why you might choose to base in the area during your stay in the city. The thing to keep in mind when working out where to stay in Tokyo is deciding what central means for you and your purposes. Technically the centre of Tokyo is the Imperial Palace, the site of the old Edo castle which is an area called Chiyoda. You’ll find it’s convenient to Tokyo station, Ginza, Akasaka and the business and commercial district. I’ve noticed many people say ‘we stayed centrally in Shinjuku’ for example. Shinjuku is 6 km from the city centre, Asakusa is 4 km but what matters most for visitors is whether it has good access (trains and subways) and whether it’s near attractions that interest you and whether there are good places to eat nearby at the end of the day. It’s almost certain you’ll be moving around the sprawling city using some form of transport, Tokyo is not a city many have time to explore purely on foot without missing out on so much of its drama and diversity. Asakusa is in the northeast of Tokyo city, around 2.5 km east of Ueno and 3.5 km from Tokyo Station. It’s an area where Tokyo’s history survives and you’ll feel this in some of its attractions, its many traditional restaurants and that there are more low rise buildings than skyscrapers around here. 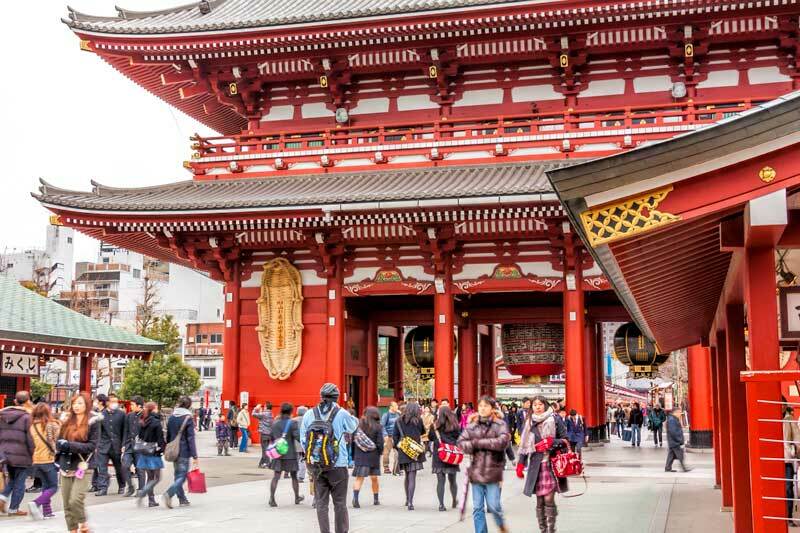 Asakusa’s most popular attraction for tourists is Senso-ji temple which dates back to the 7th century and the area around it has been popular since the Edo period when it was known as an entertainment district. A few geisha and tea houses remain in Asakusa but they are not as visible to foreigners as the ones in Kyoto. I find the best way to enjoy this part of Asakusa is starting from the outer gate called Kaminarimon which is really close to the Asakusa station exit. You can get here from other parts of the city using the Asakusa or Ginza subway lines and use exits A3~A5. The Kaminarimon gate was originally built here over 1000 years ago and the current one dates from 1960. It features an enormous paper lantern and there are guardian figures on either side. Facing us here are the Shinto gods of wind and thunder. On the opposite side facing the shopping street are the Buddhist deities, kinryu (golden dragon) and tenryu (heavenly dragon) in their human form. Through the Kaminarimon gate you enter an avenue that leads to the second gate, Senso-ji temple and Asakusa shrine. This walkway is the Nakamise Shopping street and although it’s only around 300 metres between the two gates there’s a lot to see so allow a bit of time to explore this short distance. In the day it’s generally pretty crowded through here so if you want to experience it without that intensity an early morning or an evening visit might be an option for you. Of course if you are staying in the area then that is a little easier to do but the subways run late into the night and are very safe so a late afternoon and dinner visit can be a good choice too. Next you came to the Hozomon gate at the entrance to the Senso-ji temple courtyard. This gate is even larger and more dramatic than the first one. You can see above how it dwarfs the crowd as they walk beneath it. Senso-ji temple is a substantial complex. It dates back to 645 making it Tokyo’s oldest temple. It’s also very beautiful. All of which make it extremely popular and in a city the size of Tokyo it becomes very crowded at times. Most of this crowd is concentrated around the gate and in the courtyard at the front, inside the temple buildings and throughout the rest of the temple grounds it’s not so busy. We highly recommend having a full look around inside, while many of the structures have been rebuilt in the post war era there are many statues and structures to see, a koi pond beneath the concrete bridge, a dramatic pagoda and a ‘secret garden’ tucked away behind it that’s a must see if you visit between March and early May when it’s open to the public. One reason I love to walk through Asukusa at any time of day is the food. There are many small and fabulous restaurants but the area is also special for its street food and snacks throughout the Nakamise area which includes 2 other streets that intersect with it, Donboin Dori and Shin-Nakamise Dori. You don’t see a lot of street food in Japan compared to other parts of Asia, probably because eating as you walk around is generally considered rude but there are plenty of places to find a quiet corner and if you go to the right as you enter through the main gate to Senso-ji temple there’s a large seating area and it’s OK to eat and drink there. The Japanese word for street food is tabearuki it’s literally a contraction of the words for eat and walk, I did find it surprising that there’s a word for it when walking as you eat is not something you really see a Japanese person doing, even at festivals or shopping streets like this it’s uncommon. Deciding what to try is the main challenge here. Taiyaki is one I can’t go past, it translates as grilled snapper, a type of fish but it’s actually a sweet treat usually made in the shape of a fish using moulds similar to the ningyo yaki ones you see in the photo above and cooked over a hot grill. A batter is poured in and topped with your choice of filling, sweetened red bean is the most familiar but custard, matcha and sakura are also popular. 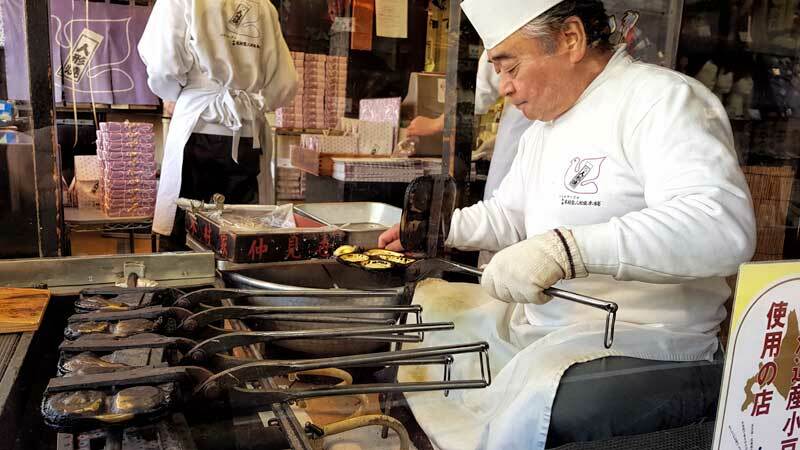 Taiyaki are best eaten warm from the grill. Other options include nikuman which are meat buns, hard candy, sweet and savoury rice crackers, ice cream and ice cream filled biscuits and the ningyo yaki I mentioned above which are a cake filled with red bean that are often boxed and purchased as a souvenir gift. Food tells the story of a city and by this point you be getting the idea that Asakusa has a great food story to tell. 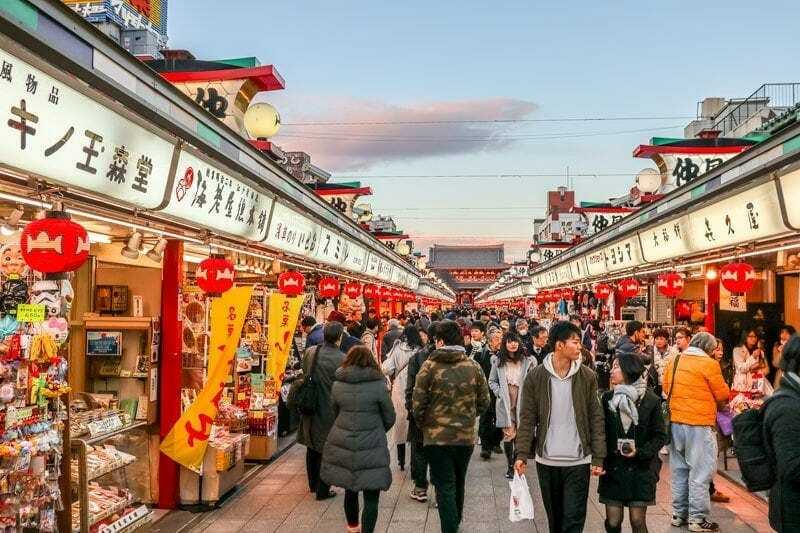 If you really want to immerse yourself in Tokyo then a local guide can help you out with that and this Asakusa Cultural & Street-food Walking Tour by MagicalTrip is a good place to start. With your local guide you’ll join the small tour group and head up the Nakamise where your guide will point out many of the interesting options for sweets and street foods to eat along the way. You’ll make your way towards Senso-ji temple where you’ll learn about its history and importance to the local area. For lunch you’ll head to a local spot in the backstreets for a tasty treat. 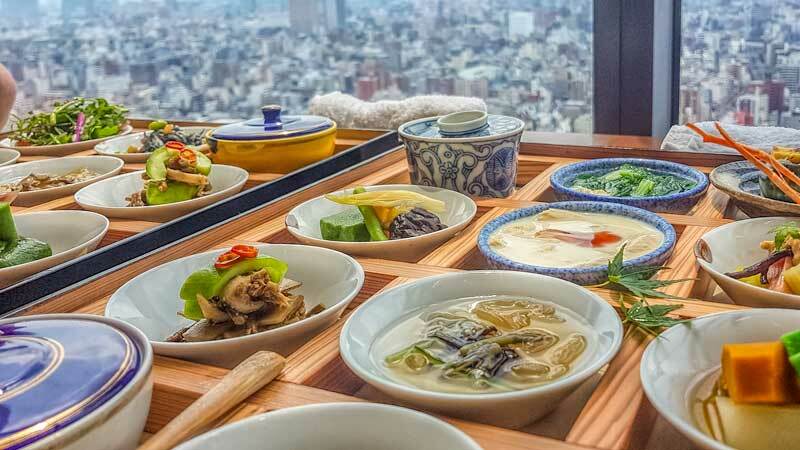 You’ll settle in to enjoy a relaxed lunch with your new friends while learning how this Tokyo specialty is prepared. Asakusa Shrine can be easily missed on a visit to Sensoji but it’s adjacent to the temple and worth including in your visit. If you exit the Hondo hall of the temple to the left you’ll make you way into the temple but if instead you take the less intuitive exit to the left or head that way later you’ll find the shrine. Asakusa shrine honours the brothers who discovered the principal idol of Senso-ji temple back in 645 while fishing. Legend says that while their fishing that day in the Sumida River was unsuccessful they found a statue in their net. Despite throwing it back and moving location several times they continued to have only the idol in their net each time they pulled it up. Later the idol was recognised as the Bodhisattva Kannon (Avalokiteshvara in Sanskrit) and the discovery led to the temple being founded here at Senso-ji. 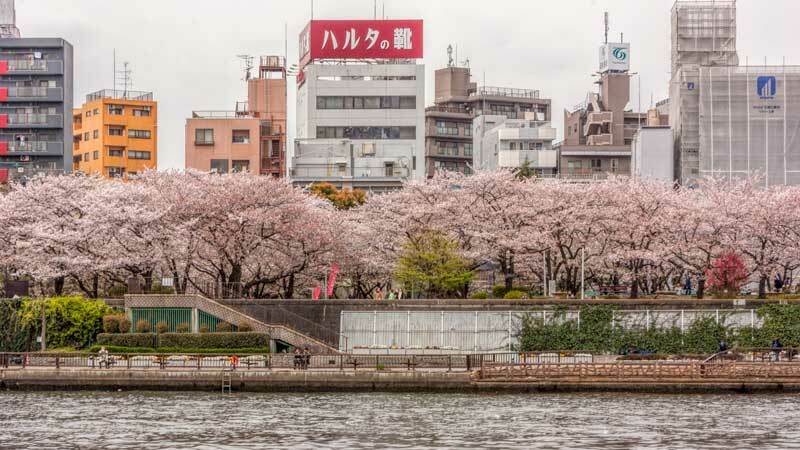 The Sumida Park is a riverside park on both banks of the Sumida River. It’s most popular during the cherry blossom season and is especially beautiful and crowded when in full bloom with cherry blossom. At other times of year it’s less busy but still a nice natural break as you walk between Sensoji temple and the Skytree or arrive at on the river trip. On the Skytree side the park is larger and includes a pond. You’ll find the tourist crowd really drops away as night falls which is counter intuitive really as this part of the city historically was an entertainment district and today there’s still a lot to love about Asakusa after dark. The Asakusa Night Foodie Tour will show you the night spots that most tourists won’t know about. You’ll visit the lively food alleys and have the opportunity to try snacks and local drinks not found in other places. You might have heard of okonomiyaki but have you heard of Tokyo’s own local version known as Monjayaki? This izakaya staple might become one of your favourites too when washed down by an icy cold Japanese beer. You learn to make and eat these dishes in an Asakusa izakaya before rounding out the evening with a stop at a very unique and fun bar. 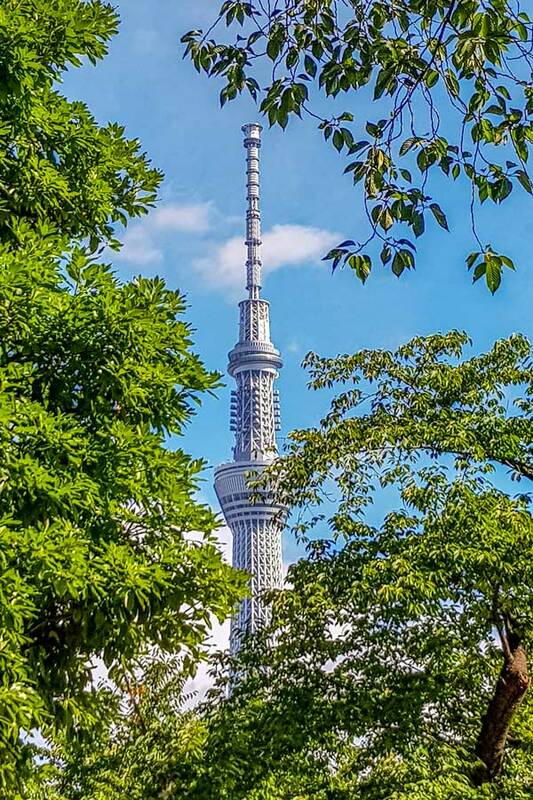 Tokyo Skytree is the newest and tallest of the towers to get a view out over the city and beyond. On a clear day you’ll see as far as Mt Fuji in Kanagawa Prefecture. There are two viewing floors, one at 350 metres and another at 450 metres each providing expansive views in all directions. Watch out on the lower level for the glass floor, do you dare walk on it and look down between your feet to the world below? I don’t have a fear of heights at all but it’ll still quite an odd feeling. From Sumida Park on the Sensjo-ji side of the river it’s about a 15 minute walk to cross the Sumida River and walk along to Tokyo Skytree. If you prefer you can take the Ginza line on the subway one stop from Asakusa station. On the ground floor as you come in from the Skytree there’s a large section that’s perfect for souvenir shopping. There were all the usual things you’d expect but many that I hadn’t seen elsewhere and at all price points. This is also where I saw the demonstration of traditional candy shaping and painting called amezaiku that we’d missed in Kawagoe earlier in the trip. There’s a good Pokemon Centre here, I didn’t even know about this one but it might be a good incentive for younger family members to spend some time around the shops. Food Marche on the 2nd Floor is where I spent most of my time looking at the fabulous supplies. This is a foodie paradise with a bit of everything, there’s fresh fish and produce but also specialty sweets, deli items and all manner of dry goods many of which make great gifts or pantry staples to take home. There are so many dining options here it will make your head spin trying to decide. I think most levels we went past had some dining options but the main dining levels are 7 and 8, then 30 and 31. 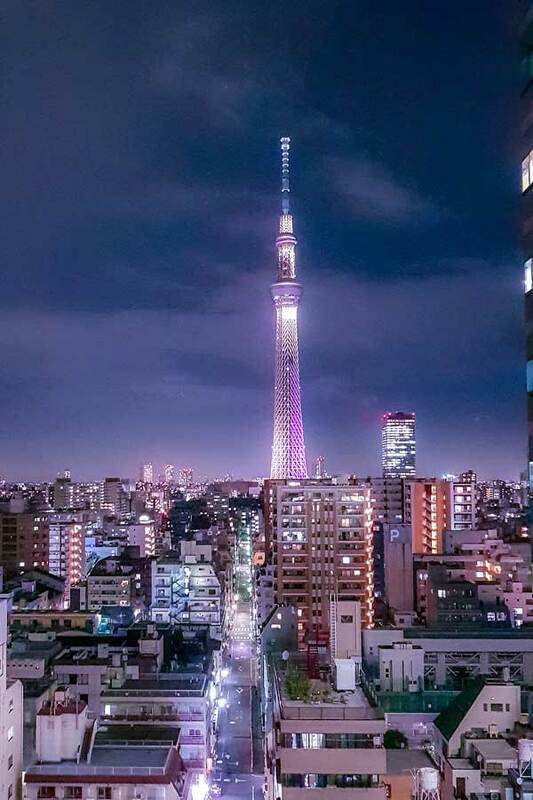 At the higher levels you are around 150 meters up and some of the restaurants offer fantastic views out over Asukusa, Kinshicho and other nearby areas plus the Skytree itself. We ate at Kunimi on level 31 and would highly recommend it, the food and service were excellent plus we were lucky enough to have the most incredible view. Seeing a city from the water is another top recommendation if you want to really get a feel for the place. In Tokyo that’s the Sumida River with Suijobus cruises. We did the boat ride during the sakura blossom one year and it’s was a great way to get a different view of the peak blossom season without the crowds. The cruise runs between Asakusa and Hamarikyu gardens near the original Tsukiji markets and we found it a good way to tie together exploring the markets, a fresh sushi breakfast and then continue our exploration of Tokyo from Asakusa after the boat ride. There’s a variety of boats in their fleet and some of them are pretty unique. 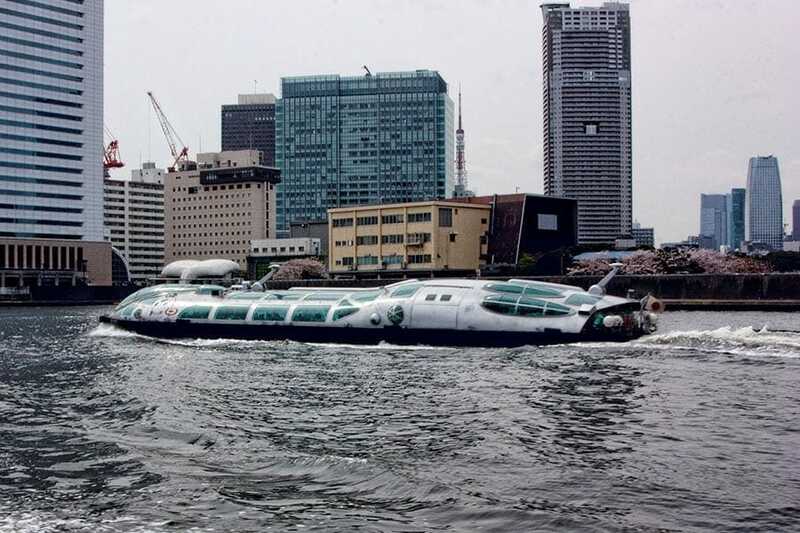 I’d have wanted to take this trip even just to add this space-age looking boat to the collection of unique transport we’ve used in Japan but the new perspective on the city from the river was well worth it. You may already know the Asahi brand, it’s a popular beer all around the world and one of the most well known from Japan. They make a huge variety and their head office is conveniently located in Asakusa if you’re in the area and plan to visit. 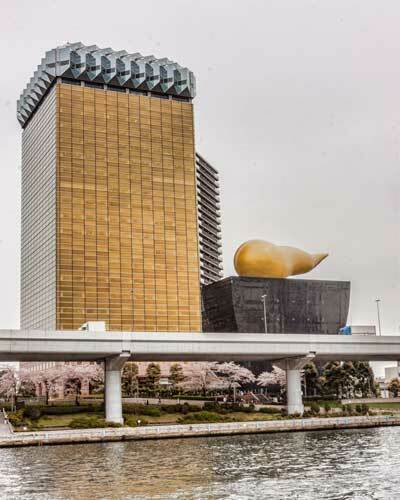 The Asahi headquarters are made up of two buildings, one designed to look like a beer glass with a frothy head of foam and the other has a distinctive golden flame on top. Asahi started brewing on the site over 100 years ago so it has a long connection to the brand. While no beer is brewed here any longer, which means there’s no factory tour you might want to stop by for the interesting architecture or as an Asahi fan to taste from a full range of their beers. If you want to taste the produce we’d recommend heading up to the Sky Room on level 22 of the taller building. Here you can try their icy cold beers and other drinks while taking in the view from the observation floor. There’s no entry fee as such for this one but you are required to buy a drink for each person and I have been told that they will ask someone to leave if they don’t have a drink. From Asakusa it’s about a 2 km (20 minute) walk west to neighbouring Ueno which can be a good destination to discover next. To make this walk more interesting wander via the Kappabashi Kitchenware shopping street. There are dozens of shops down here with a cooking and kitchenware focus. Although it focuses mainly on the restaurant trade it’s interesting to browse and an opportunity to pick up a unique and useful souvenir from the lacquer and ceramic ware, a Japanese kitchen knife or perhaps some plastic food? We’ve mentioned before that our top tip for deciding where to stay in Tokyo is convenient access to subway and JR stations. When making you way to Asakusa station from other parts of Tokyo you want either the Asakusa or Ginza line. For us access to the Ginza or Marunuchi line are the most useful to have in Tokyo because they access the areas we go most frequently but it really doesn’t matter too much, there are plenty of interchange stations where you can easily and quickly move from one line to another. If it all sounds a bit confusing check out our guide on how to master the Tokyo subway like a local. 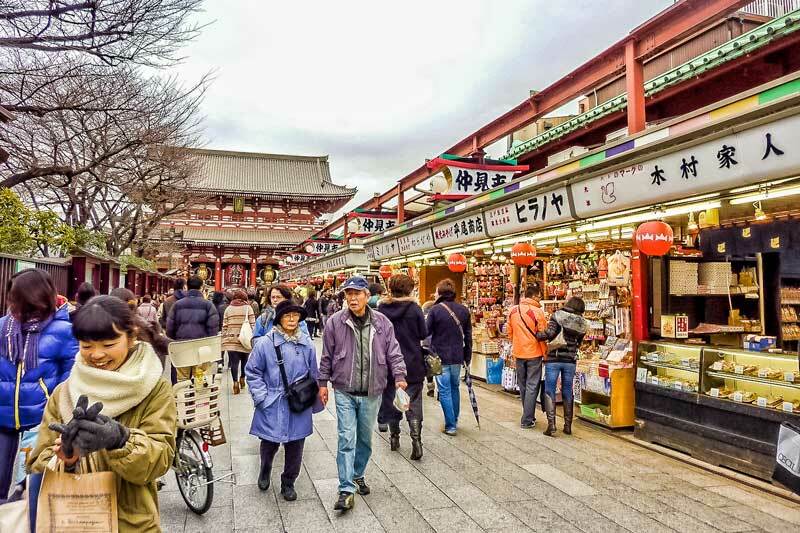 Asakusa station is convenient for accessing Senso-ji temple and the surrounding attractions, just watch out when you arrive for exits A3~A5 and you’ll come out very near the first temple gate and shopping street. If you prefer to start on the other side of the river with Tokyo Skytree or take the subway across from Asakusa rather than walking the Skytree and Solamachi have their own subway station underneath that you can also access on the Ginza line. 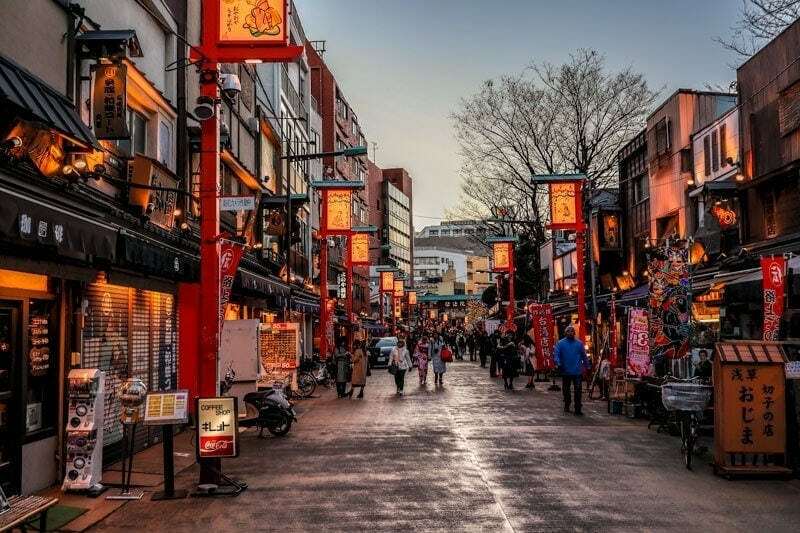 As we’ve seen there are some interesting attractions to discover by both day and night in the Asakusa region and there’s also a good selection of restaurants across a variety of price points. While it’s outside the central city region meaning a bit more commuting to get to some of the more popular destinations in Tokyo it does have 2 useful subway lines. The Ginza and Akasuka line give access to a wide variety of destinations around the city and connections to JR stations if you’re headed further afield. It’s also the Tokyo base for the private Tobu Railways that service the northern suburbs and through to Saitama, Tochigi and Gunma prefectures, you’d use this line for a day trip to Nikko for example. Being slightly less central you may be able to pick up good value deals for a stay in Asakusa, as an indication it’s around 15-20 minutes to Tokyo Station or Ginza. The Gate Hotel Asakusa is very conveniently located within the historic neighborhood of Asakusa. From the hotels it’s a 5 minute walk to the subway station or the Karinarimon gate and there is an excellent selection of restaurants in the immediate area of the hotel. The Gate Hotel is a boutique style hotel that opened around 6 years ago. It’s modern in design, clean and offers good sized rooms for Tokyo with free WIFI. A good mid-range pick is the Richmond Hotel Asakusa which coincidentally is also around 6 years old and rated for it’s modern design and cleanliness. It’s located 3 minutes walk from Senso-ji temple, 10 minutes to Asakusa subway station and 30 minutes to the Tokyo Skytree. You’ll find the rooms a little smaller but there’s free WIFI, a coin operated laundry onsite and a microwave for guest use. A slightly different option is the Tobu Hotel Levant which is on the other side of the river, technically in Kinshicho making it slightly further from the main attractions of Asakusa. It’s a 2 km walk to Skytree and 3 km to Sensoji temple, or a couple of minutes by subway. However as far as convenience goes this hotel has a whole lot going for it. It’s a stop for the hotel limousine bus going to both the Haneda and Narita airport or you can get a direct train from either airport. I did it from Narita recently and it’s so easy with no transfers. The hotel also offers a free shuttle to the Disney Parks making it very attractive to families. The big bonus though is that it’s adjacent to Kinshicho station which is a JR and subway station making it super easy to get around in Tokyo and further afield. There’s good shopping, convenience stores and a huge number of restaurants at all price points and styles nearby. 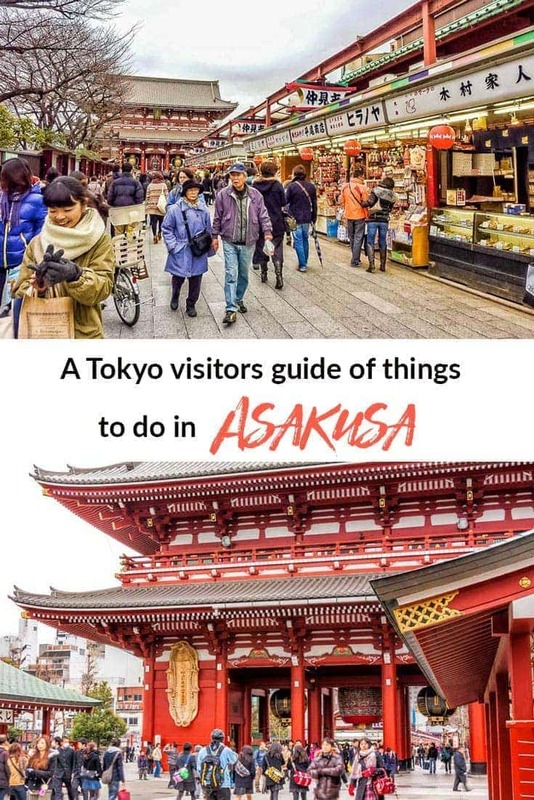 If you plan on taking on a walking tour of Asakusa taking in some of the attractions we’ve mentioned here in the post I’ve included a map below that you can access or save to help plan your route. If you have any questions about Asakusa please ask in the comments below, we do our best to answer all questions and comments. If you have anything to add or suggestions to include that we might have missed we’d love to hear your ideas too. I have found your website very informative and useful in planning our first trip to Japan. We will be flying into Tokyo and staying at the Richmond at Asakusa, and my research suggests that the Keisi express from Narita Airport to Asakusa is the most convenient as it seems to be the most direct without having to transfer from other stations. I would welcome your comments please. Hi Julia. Keisei would be a good option, some of their trains have continuations that can take you from Narita Airport through to Asakusa without changing trains, check online at the time or let them know at the counter when you buy your ticket that is what you want as not all departure times work that way. There are 6 major Sumo tournaments a year each running for a fortnight, 3 of them in Tokyo and others in Osaka, Fukuoka and Nagoya, they are the best time to watch it. Unfortunately December isn’t a tournament month. Other than that there are a few tours that go to the sumo stables and watch training bouts and at least one place that has a small window for viewing so you can just turn up and see the training in progress, if they are training that day. Sorry but it is really hard to have a sumo experience outside the national tournaments.